Because not everyone begins studying at a young age, and comes to Tai Chi Chuan, Yoga, and the Internal Martial Arts with different goals in mind we offer more than one training format. All of our training is traditional. It is adapted to fitness level, time commitment, and interest, any changes are not what we teach but how we teach it. We teach in plain English using Chinese terms only when there is no valid translation and assume little to no knowledge of Chinese culture part the student. 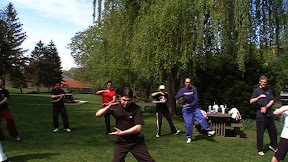 Many people do not feel they have the time, ability or mental focus to study Tai Chi and Qigong. Classes focus on the Health (Civil) branch of training, and begin with basic conditioning. Included are the Thirteen Energy Tai Chi form, Qigong stetching strengthening exercise, and Standing or seated meditation. In December of 2012, we will launch our own private certification programs for Adjunct Medical & Fitness Professionals and Layman Teaching Assistants. These programs will provide some of the Bare Basics You will need to incorporate a small introductory group and lead to the more complex Professional Instructor Certificate. The Certificate Series will include our Virtual Training System and require regular contact and support from your assigned instructor. Taiji Warrior Yoga is a Power and Flow Yoga Fusion designed by an expert in Eastern Energy Based approaches & Western Bodywork &conditioning that brings together Yoga with the principles of Chinese Tai Chi, Qigong, and Tao Yin. It incorporating research into how our body moves and works by leaders in the study of the "Neuro-Fascial Web", the soft tissue structure formed by our nerves, muscles, and connective tissues. In 2012 we will begin a new series for medical and alternative health care professionals.Tai Chi and Qigong have been making headlines in the the medical reasearch news, but few doctors, chiropractors, nurses, physical therapists & other medical providers have been exposed to Tai Chi, Qigong, or their Sibling arts in a personal way.Throughout 2012 we will be providing workshop days and events, beginning with World Tai Chi & Qigong Day April 28th to help provide you with an insight into these arts.We will also be providing any medical facility within our normal practice area that request it, a free onsite introduction and discussion on science and uses of Tai Chi, Qigong and their Sibling Arts covering what research now shows and possible areas that have yet to be explored. Self Care Seminars will also be made available to high physical demand healthcare fields at a reasonable rate.